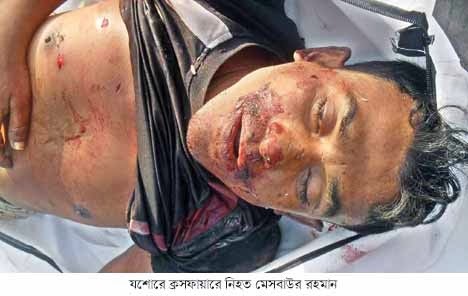 By Bangladesh Media; One more killed by Rapid Action Battalion (RAB). Spot: Abhaynagar upazila of Jessore, and Rapid Action Battalion (RAB-6) involvement has been confirmed by the authority. Victims name is Mesbah-ur-Rahman. He, the prime accused in Awami League leader Chaitanya Kumar Mondol murder case, was killed in a "gunfight" with the Rapid Action Battalion in Abhaynagar upazila of Jessore early yesterday. Mesbah-ur-Rahman, 40, chief of a criminal gang locally known as Mesbah Bahini, allegedly had ties with the BNP and Jamaat-Shibir. A group of miscreants led by Mesbah reportedly hacked and burnt Chaitanya Kumar Mondol, a retired army personnel and youth and sports secretary of Magura ward AL, to death inside the latter's drugstore in Magura bazaar in Abhaynagar on January 26. Two days into the homicide, Mesbah's second-in-command Rabiul Islam, 35, was killed in a gunfight with the joint forces on January 28 at Ziadanga in Abhaynagar. Mesbah was wanted in a number of cases, including seven for murders, said Khabiruddin Mollah, officer-in-charge of Abhaynagar Police Station. On information, a team of Rab-6 conducted a drive at Panchtala village around 4:30am yesterday when Mesbah was holding a secret meeting with his associates there, said the OC. Sensing the Rab's presence, his cohorts opened fire on them, triggering a gunfight with the law enforcers. "Mesbah was caught in the line of fire and died on the spot while other members of the gang managed to escape," the OC said. According to locals, Mesbah stepped into the crime world in the early nineties by joining the notorious Hasan-Mizan gang of Shankarpur in Jessore town. He soon engaged himself in crimes like murder and robbery under the leadership of gang leaders Hasan and Mizan, who were brothers. After the brothers were killed in crossfire in 2009, Mesbah and two of his friends from the gang settled in Dhaka and continued their criminal activities. Two years ago, Mesbah returned to Abhaynagar and formed a new gang, locals said.